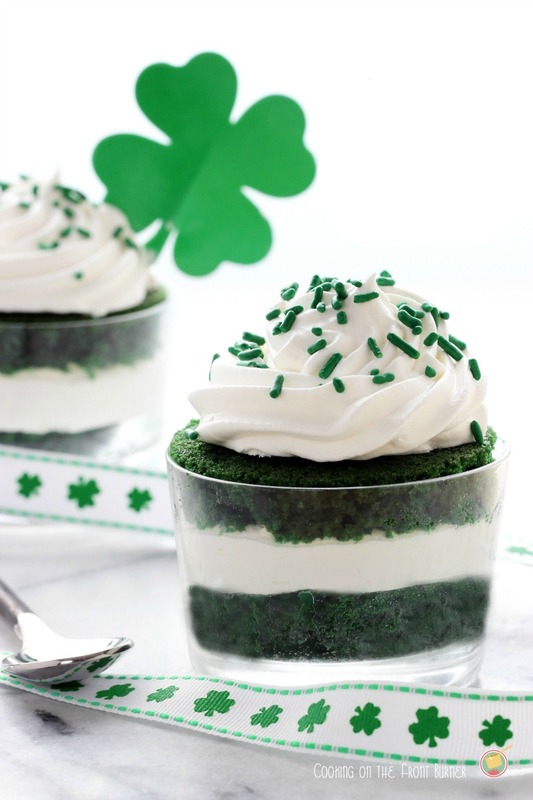 Leprechaun Cheesecake Shooters are a bite-sized dessert that will be sure to satisfy the leprechaun in your life! They are a match made in dessert heaven! 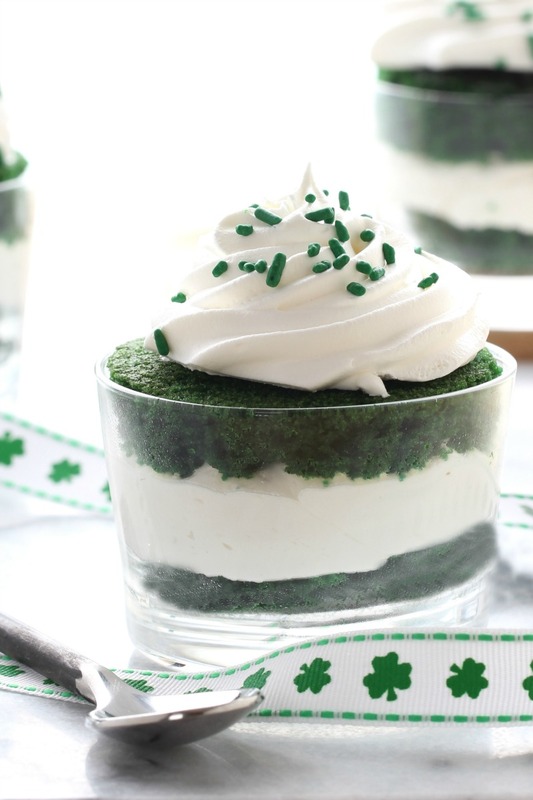 St Patrick’s Day desserts are all about green! These Leprechaun Cheesecake Shooters are a mini green velvet cake filled with mint no-bake cheesecake, and topped with whipped cream and sprinkles for a fun treat everyone loves! A great party dessert or individually portioned treats for kids. These easy cheesecake shooters will be the talk of your party!! I love creating desserts for holidays. It’s a time for me to be creative and have some fun with colors and flavors! I’m really drawn to mini desserts, I’m mean really, they’re just so fun! I’m sure everyone has heard of red velvet cake, but today we’re making green velvet cake for St. Patrick’s Day. It’s a simple matter of changing out the traditional red food color, so if you have a favorite red velvet recipe you can use it for this mini dessert just by substitute green food coloring. Or you can use the green velvet cake I prefer in the recipe below. 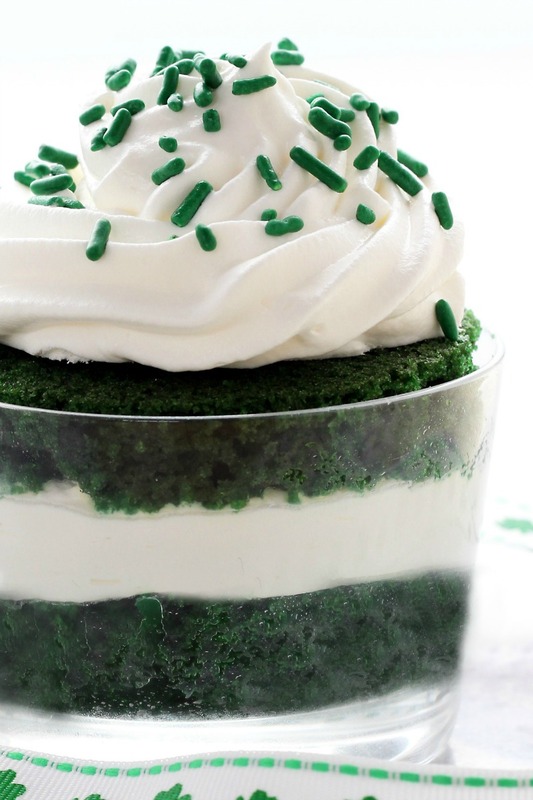 While I made my cheesecake cakes as mini desserts, you could easily make this into a full sized green velvet cake by taking the 2 round cakes, filling them with the cheesecake, and then frosting with whipped cream or Cool Whip. You will have leftover cake if you’re making the mini cheesecakes, but it’s so good we end up eating the cake scraps plain or with some mint chip ice cream. We tend to like our desserts here! Hope you have a Happy St. Patrick’s Day! Sift the flour, cocoa, and salt together in medium mixing bowl. Set aside. In a large mixing bowl, combine the sugar and oil; mix for 2 minutes. Add the eggs one at a time, mixing until just combined. Add the vanilla and mix for another 2 minutes. In a small bowl, combine the vinegar and baking soda. Add the baking soda mixture, buttermilk, and food coloring to the other wet ingredients; mix for 1 minute. Add dry ingredients to the wet ingredients, and mix well. Pour cake batter into the prepared pan and bake for 18-20 minutes, or until a toothpick inserted in the center comes out clean. Carefully remove from the oven and let cool in pan for 10 minutes. Remove cake from pan and take off the paper. Cool completely on a wire rack. For cheesecake filling: Beat the cream cheese and sugar until creamy and smooth. 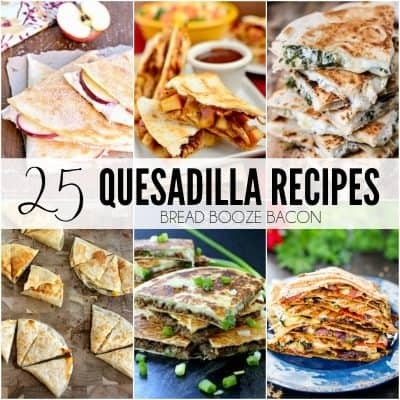 Add vanilla & mint extracts and mix together. Then, fold in the Cool Whip by hand. To make shooters: Cut out circles of the cake to fit your serving glasses. Place a cake round in the bottom of a mini dessert glass. Top with cheesecake and then another cake round. Top with additional Cool Whip and sprinkles if desired. If you can't find Cool Whip, stabelized whipped cream will work too. If making this recipe as a full sized cake, Prepare the cake as directed. Cut the cake rectangle in half to create two smaller rectangles. Cover one half of the cake with cheesecake, top with the other cake half, and then top with Cool Whip and sprinkles.